A scrappy little survivor missing its tails. Looking out my window I saw a large, yellow and black striped butterfly, the Western Tiger Swallowtail (Papilio rutulus). 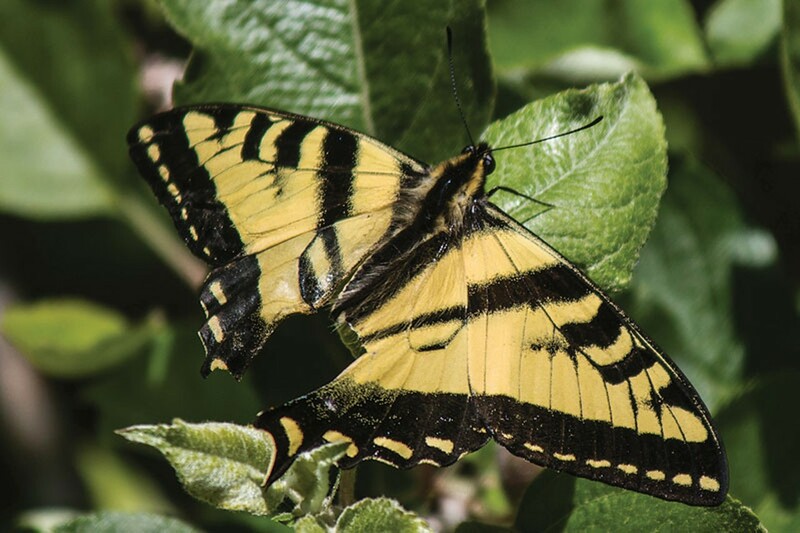 The family papilio includes the zebra, black, spicebush, anise, pipevine and pale swallowtails. The tiger is the largest and most common of them all with a wingspan of 4 or 5 inches. Their larvae get pretty big and are smooth and brown, with a yellow and black stripe across their bodies just behind their head and colorful eyespots. They feed on cottonwood, willow, quaking aspen, alder, maple, sycamore, hoptree, plum, ash and possibly other trees as well. Like all swallowtails, when threatened these caterpillars evert "stinkhorns" (osmeteria) which give off an unpleasant odor. Lining up my camera for a few shots, I noticed the "swallow tails" were missing, along with a good bit of both hind wings. This is not uncommon — a bug's life is not an easy one. Something, most likely a bird, ripped off those pieces. Despite the damage, it managed to flit gracefully from one buckeye flower to another, sipping nectar through its long, tubular proboscis, which, when not in use, is coiled up neatly like a watch spring. The adults don't seem picky at all about the flowers on which they feed, even occasionally trying plastic ones. 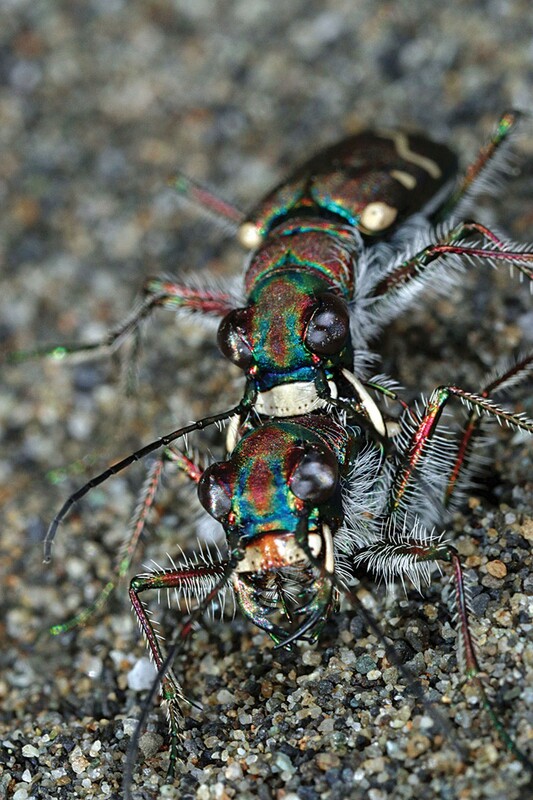 One of my favorite beetle species is out and about now, hunting by the dozen on sandy stretches of river bar: Cicindela oregano, commonly known as Western Tiger Beetle. About half an inch long and gray, they dart here and there and are among the fastest running creatures for their size. According to a Scientific American article a few years ago, they're so fast they have to stop periodically to allow the data fed from their outsized eyes to their tiny brains to catch up. But it isn't just speed that makes them interesting. Viewed close up, that calm gray suit is decorated with lighter cream dots, one of which looks like a musical notation for an "eighth note." Viewed at this scale the next thing to notice is the jaws. You also start to see bright metallic greens and blues. A little closer in and the colors are intense. Like most beetles, their front wings, or elytra, are tough shields encasing and protecting their delicate folded-up hind flight wings. The top of the abdomen hidden by those is all brilliant metallic greens and blues, which are almost never seen. When I'm walking along my favorite old dirt road next to the Van Duzen River, they flit in front of me, taking wing, making a short, low flight of about 9 feet and landing — often facing the perceived danger, me. Members of the family of ground beetles (Carabidae), they are rapacious hunters, running down their prey and piercing it with outsized jaws that are as long as their heads. Their larvae are just as predatory, making pits in the sand and waiting, buried at the bottom, to devour any hapless ant or other small insect that falls in. This time of year you can often see the other use they have for those mandibles. The males use them to hold onto the female while mating. He needs to; he's in for a wild ride. She seems to hardly notice, continuing to run about capturing prey and evading danger, all the while carrying her fella, embraced by those wicked chompers. Despite its fierce nature, his outsized armament does her no harm.